Cabin Exit Vent: 2 aluminum, louvered, round grills installed behind the seats in the non-structural area near the baggage compartment; i.e., the rear baggage panel or baggage shelf.Fuselage Exit Vent: an aluminum, louvered, round grill (mounted in a non-structural inspection plate) that is installed by replacing an existing non-structural inspection plate in the rear fuselage area. The grill is equipped with a screen to deter insects and water from entering. Description AIRFLOW ENHANCEMENT KIT Better airflow means more comfort For proper climate control in your aircraft's cabin, air that enters must be allowed to exit the aircraft in an efficient way. When air can't escape, the effect is like blowing into a bottle. The Airflow Enhancement Kit improves cabin air flow by approximately 30 percent. Which means you fly in greater comfort. Also the Heater performs better. Why you need the Airflow Enhancement Kit The Airflow Enhancement Kit works with your Ventubes™ to give you even better ventilation in your aircraft. Historically, the Cessna cabin had sufficient air leakage to mitigate the air flow problem. As the aircraft have matured, they have been renovated with better insulation, and tighter seals around the doors and windows. These renovations have reduced the air leakage and, at the same time, decreased air flow in the cabin. The Airflow Enhancement Kit by Soros, Inc. will dramatically improve the air flow in your craft. Installation Cabin Exit Vent and Fuselage Exit Vent can be installed under the owner/operator regulations. Approximate installation time is 2 hours for CEV and 30 minutes for FEV. VIEW INSTALLATION INSTRUCTIONS PDF Product Specifications Cabin Exit Vent: 2 aluminum, louvered, round grills installed behind the seats in the non-structural area near the baggage compartment; i.e., the rear baggage panel or baggage shelf. 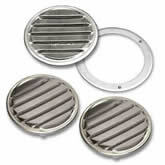 Fuselage Exit Vent: an aluminum, louvered, round grill (mounted in a non-structural inspection plate) that is installed by replacing an existing non-structural inspection plate in the rear fuselage area. The grill is equipped with a screen to deter insects and water from entering. The Kit includes: 2 Cabin Exit Vents - allows air to exit to fuselage. 1 Fuselage Exit Vent - allows air to exit the aircraft. Fits most Cessna Models 120, 140, 150, 152, 170, 172, 175, 177, 180, 182, 185, 190, 195, 205, 206, 207, 210.